Transport economists, behavioural psychologists, engagement strategists, city councillors – you can go home now, the kids get it! As many people on bikes know, one of the great things about cycling is how easy it is to engage with the world around you. Stopping your bike is easy, but more often than not, a lot of encounters happen on two wheels. This is the story of an unexpected bike encounter. The morning had a bad start. I was frustrated with the news of the Thorndon Quay cycleway developments. To top it off, I had to drive today. My regular routine is to bike to school with Mr. Nine and Ms. Six and then continue to work on my bike. But it was the school holidays and the holiday programme that we’d chosen for that day wasn’t accessible by bike. Not because of the distance, my kids are able to cycle the distance, but there simply wasn’t a safe route for the three of us to cycle between Island Bay and Mt. Vic. Whenever we go out, I try to show my kids different types of people on their bikes, not just your typical middle-aged man in lycra (disclaimer: I do not wear lycra). So, as we are driving along the great Island Bay cycleway I spot a woman riding her e-bike with a funny helmet. It had googly eyes stickers on the back of it. I show it to my kids and we share a laugh. – Me: Look at the funny helmet lady, she is getting to the CBD as fast as we are. – Mr. Nine: Yeah, if there were cycleways to the city we could bike to our holiday programme. – Ms. Six: And people would be jealous (laughs)! – Mr. Nine: And if we make them jealous, more people would ride their bikes! – Ms. Six: We should ask the mayor to build more cycleways so we can ride everywhere! – Mr. Nine: And then less people would drive. – Ms. Six: Yeah! And if we’re riding on a cycleway and there are no cars, we won’t need a helmet! The rest of this thread was the resulting dialogue between Mr.9 and Ms.6. Mr9: If there were cycleways to the city we could bike to the holiday program. Ms6: And people would be jealous. Mr9: And if we make them jealous, more people would ride their bikes! My wife and I both try to be role models and ride our bikes as much as possible, but we’ve never taught them about induced demand and mandatory helme laws. Boom! I could not believe the dialogue I just heard. 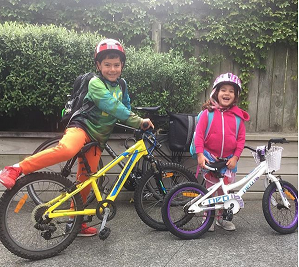 My kids, completely on their own, had figured out that more roads just induce demand for more driving, and cycleways are the antidote. Not only that, they also realised that helmets are not an effective protective gear for people on bikes. The most effective gear, from their perspective, is … dedicated cycling infrastructure! Kids are smart, they know that a simple plastic helmet is not going to be any real use in a car crash. Still flabbergasted by the dialogue I rambled on Twitter (as one does) about the situation, sharing our conversation to bring attention to the fact that our transportation network objective must be to move people effectively, instead of moving cars. It was still the school holidays. I was taking the kids to the same holiday programme during the second week. As we drive around the Basin Reserve and enter Kent Terrace I notice a woman on her bike - and then I check out her helmet. Yes, we meet again, unfortunately this time just for a brief moment. I drive past her and we turn into Mt. Vic. As we drove past I remind the kids about funny helmet lady. They get excited. Ms. Six wanted to roll down the window and wave to her (unfortunately the window had been child locked). Nevertheless she notices the woman. – Ms. Six: She looks so happy! – Mr. Nine: Yeah, and she won’t be late for her work. – Mr. Nine: Because she’s RIDING A BIKE! DUH! We saw the funny helmet lady today again. Ms6: She looks so happy! Mr9: yeah, and she won’t be late for her work. The school holidays were over. We are back to our routine: ride to school with the kids, then off to work. I am in Berhampore again when all of a sudden someone rides past me up the hill on Adelaide Road. I looked ahead and saw the same white e-bike with a flower pattern bike bag on the back and the funny helmet with the googly eyes. Yes, it was the funny helmet lady! I had to talk to her. Our story had to be shared. The kids would want to know her name. But how can I talk to her? She’s much faster on her e-bike. My years of mountain biking would have to help me. I do a massive push uphill, but she’s still way ahead of me. As we get to the top I pedal faster. We’re now on the descent towards Newtown and I catch up to her at the corner of Countdown at the red light. – Me: Sorry, I’ll tell you at the next light. – We bike a bit further and stop together at the next red light. – Me: Hi, my kids and I saw you riding your bike a couple of times last week and they both love your helmet. – Me: Yes, I try to show different people riding bikes to them and they loved seeing you on your bike, with the funny helmet and the flowery bike bag. We called you the funny helmet lady. I am Pablo, by the way. – Her: Oh, that is so great. I am Alice. – Me: My daughter even said the last time we saw you that you looked very happy and that made her happy. – Alice (laughing): Yeah, my friends tell me that I always have a smile on my face when I am riding. – Me: I can’t blame you for that. I am always happy on my bike too. We ride together and make small talk through the Basin Reserve, where we part ways. She passes along greetings to my kids and carries on. I am happy to have met a new person, and Alice seems delighted to have made an impression on my family.